Designed to produce high quality 5 ft. x 6 ft. bales, these round balers are equipped to handle all types of crops and can take on the most demanding field conditions. Along with proven durable design, Kubota's 5 ft. x 6 ft. balers offer a variety of hard-working standard features, including being Silage capable. 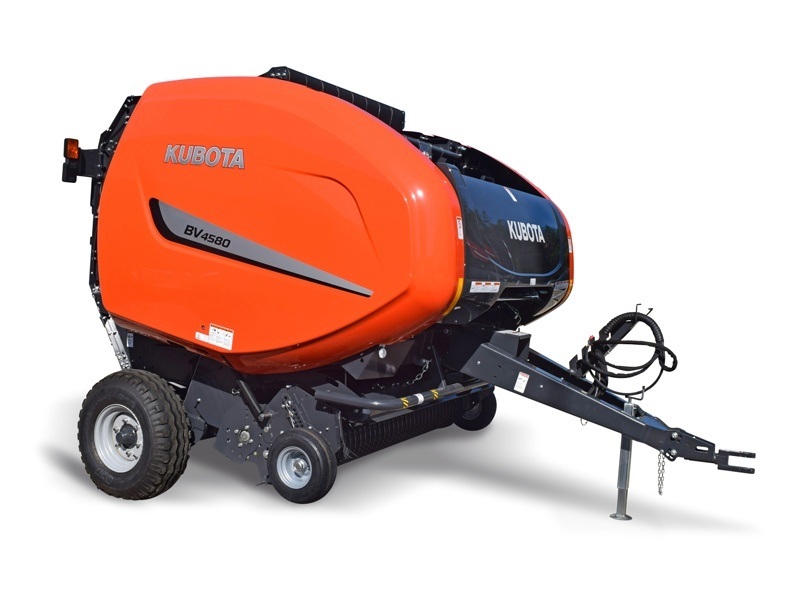 ROTARY FEEDING SYSTEM: All BV4580 balers are equipped with Kubota’s EasyFeed rotary feeding system. This technology incorporates integrated augers into the rotor feed design, allowing the crop to flow across the entire width of the bale chamber, resulting in increased capacity and bale density. FOCUS CONTROL TERMINAL: The Focus III Terminal gives you full control of all functions on a high density color digital display from the tractor cab. The Focus III terminal monitors and controls all necessary functions including bale size, bale count, net wrap count and twine settings. THREE WAY BALE SHAPE INDICATION: 1. Three way bale indication shows bale shape (of each side and middle of the bale). 2. Driving indicators show driving direction for perfect bale formation in all windrows. POWERBIND NET WRAP: BV4580 balers come with Kubota's patented PowerBind net wrap system. This completely redesigned technology has allowed Kubota to get away from the old feed rollers and eliminate many high wear items. The net is fed directly into the bale chambers by injection plates. This design keeps the net tight at all times, which provides accurate and extremely reliable net injection. In addition, the PowerBind net system is extremely simple with a very low loading height (no tools required). DURABLE MRT PROFILE BELTS: Durable MRT profile belts with heavy duty MATO lacings. HIGH CAPACITY PICK-UP: These balers feature a 5 bar 86 in. heavy duty pickup. The low profile pickup is designed with closely spaced tines which provides for a very smooth flow of crop into the baler. This design provides unparalleled pickup capacity, from light windrows all the way up to heavy silage windrows, and can easily be seen from the tractor. Main drive chain - 1 1/4 in.